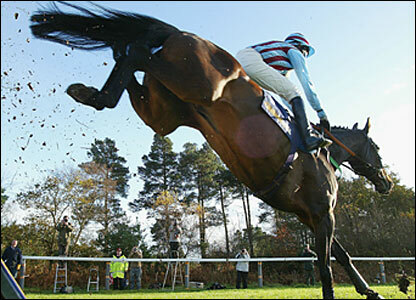 The Cheltenham Gold Cup is the feature race of the National Hunt horse racing season in the UK and Ireland. Globally, racing where horse jump fences and run over distances in excess of 2 miles receives little attention compared to flat racing. 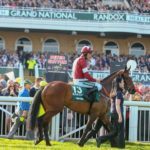 The Gold Cup in fact is run over a distance of 3 miles 2 furlongs and 22 fences are required to be jumped and as such, attracts the best thoroughbreds with the stamina and ability to see out the challenge. The race is a great sporting spectacle and during its 88 year history has developed a rich heritage, becoming one of the highlights of the British and Irish sporting calendar. 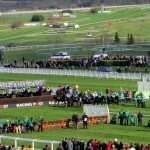 In the USA, TVG and HRTV give coverage of both the Gold Cup and four day long Cheltenham Festival which runs 15th – 18th March in 2011. There has only been four horses in history that have won the Cheltenham Gold Cup three times and one of those, Golden Miller, actually won it five times and also became the first horse and one of only two ever to have also won a Grand National. Golden Miller won the Gold Cup for five consecutive years between 1932 and 1936 and also won the 1934 Grand National. He was owned by the highly eccentric Dorothy Paget a self declared man hater and one of the most difficult owners any trainer served. Her very rich family was steeped in thoroughbred racehorse ownership and she owned her own stables in Ireland as well as a stud breeding farm. She in fact owned two other Gold Cup winners, Roman Hackle who won in 1940 and Mont Tremblant who took the honors in 1952. Despite the lack of television Golden Miller himself was one of the most popular horses of all time, he was a household name, who won 29 races from 52 starts. He was discovered and trained by Basil Briscoe a well know Eton educated trainer, who persuaded Paget to buy him. It was a very successful arrangement until Briscoe got himself fired by Paget because Golden Miller refused to jump a fence in the 1935 Grand National. She replaced Briscoe with Owen Anthony another top trainer of the day who trained him for his final Gold Cup victory. Cottage Rake was the next legendary horse to achieve a hat trick of Gold Cup wins who managed at the same time put his trainer, the great Vincent O’Brien on the road to create his own legendary status in the world of horse racing. Cottage Rake won the Gold Cup three times consecutively between 1948-1950 and went on to win the King George Chase at Kempton Park, which came in 1948. He was ridden in all of his big races by Aubrey Brabazon, one of the finest jockeys around at the time. So revered was their partnership that a song was written about them. The great Arkle was the next to achieve the feat and in so doing earned himself the reputation of the greatest National Hunt Chaser of all time. Arkle won the Gold Cup in 1964, 1965 and 1966 and recorded the highest timeform rating of all time of 212. Arkle was trained in Ireland by Tom Dreaper and ridden throughout his chasing career by the brilliant Irish jockey, Pat Taafe. 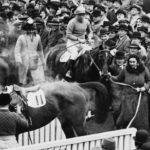 In his first victory, Arkle had to overcome the great English champion, Mill House, who had won the Gold Cup in 1963 and had beaten Arkle in the 1963 Hennessey Gold Cup. However by the time the two got to Cheltenham it was Arkle who had continued improving and he dished out a five length defeat to Mill House and never lost to him again. When winning the race the following year (1965) for instance Arkle beat Mill House by an astonishing 20 lengths and won by even further in 1966 (30 lengths) after going off a 1/10 (-1000!) 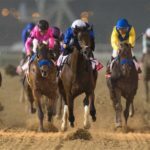 , the shortest price ever in Gold Cup betting history. In total Arkle won 27 of his 35 races, which included an Irish Grand National, a king George Vl Chase, two Hennessey Gold Cups as well as a Whitbread Gold Cup. Sadly Arkle fractured a pedal bone after striking a guard rail in the 1966 King George Chase. Despite the bad injury he still finished second in the race but he never made it back to the racecourse again. He died at a very early age of just 13. The latest three timer of course is the tragic Best Mate, winner of the Gold Cup in 2002, 2003 and 2004 and was antepost favourite to win in 2005 but a burst blood vessel eight days before the race kept him on the sidelines. From 22 starts in total, Best Mate won 14 of them and was second in seven only failing to finish in his final race, the 2005 Haldon Gold Cup at Exeter which of course is when he died after being pulled up by jockey, Paul Carberry the rest. Best Mate was owned by Jim Lewis and trained by Henrietta Knight and ridden in his three Gold Cup wins by Jim Culloty. In addition to his Gold Cup successes he won a King George Vi Chase, a Haldon Cup and an Ericsson (now Lexus) Chase, plus a host of other graded races. The only reason why his rating was no higher than 182 was simply that he was kept for the high grade races and never got involved in any of the big handicap events. There is no doubt that another horse or two will join this exclusive club, indeed, Kauto Star, has won the race twice and will go for a third victory in March. Having already won in 2007 and 2009, Kauto Star is already the only horse to regain the Gold Cup, a win in March will make him a fifth three time winner and the only horse ever to regain the Gold Cup twice! ← Do That Many People Really Care About the University of Texas?